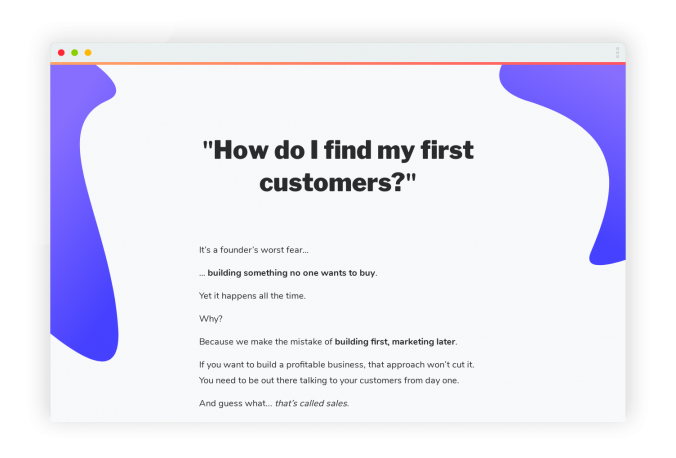 If you’re launching an ebook, course or consulting product, you might find this article useful. You’ll notice from the writing style I didn’t have much time to work on this article. It definitely isn’t a ‘how-to’ guide. But I do point out mistakes I made along the way. The idea for Sales for Founders had been brewing for a while. I’ve always thought that founders – especially technical founders – spend way too much time thinking about marketing and product, and nowhere near enough time on sales. My suggestion of “sales” advice was by far the most requested. More and more, I’d see early stage founders struggling with sales. I decided to take a deeper look at the pain and talk to founders who were struggling with sales. Luckily, I mentor a few founders and have a couple reach out to me for advice/feedback after every newsletter I send, so this only took a few minutes. The good news was that I seemed to be right about the pain – everyone I asked was willing to pay for sales advice. And I was sure that I knew enough about sales to teach founders how to sell successfully. Just like most founders with a new product, I need to learn more about my customers’ pain to really help them. 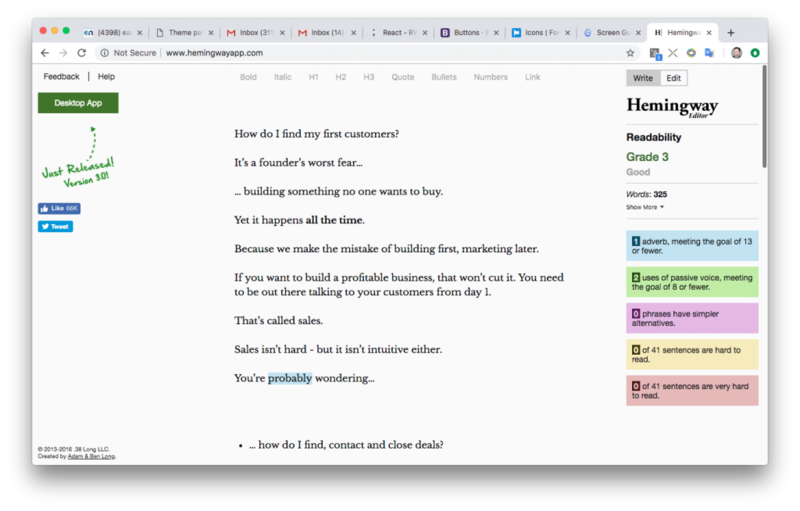 So instead of writing an ebook or filming a video course, I decided to make the first version of my sales for founders course interactive. That way, I can be sure that my customers get what they need and I learn enough to be able to turn it into a written/video course in the future. Like I said, the first version of the product would be live teaching. Making sure I identify, understand and solve my customers’ pain points successfully. 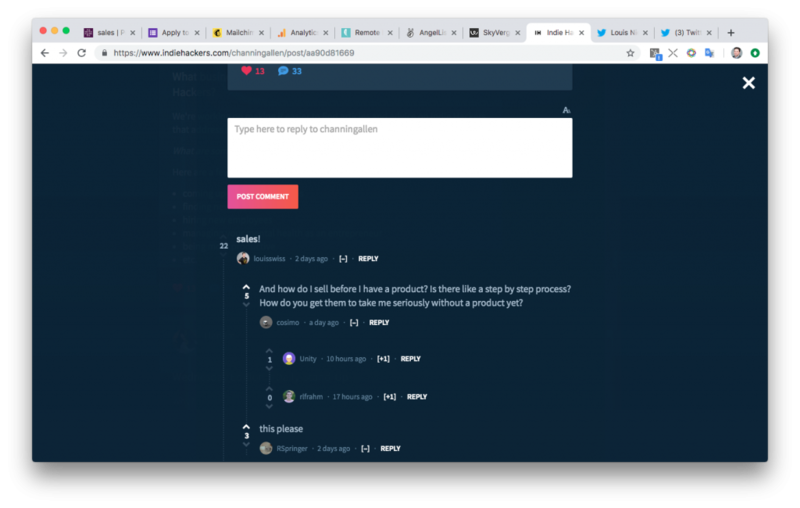 In total, I hit upon a format of five group tutorials and three 1-on-1 coaching sessions. This isn’t scalable, but putting in the work now means I can guarantee results and create the best course on sales for founders afterwards. Because of the amount of work involved, I decided to limit the first course to at most seven participants. To be honest, I wasn’t expecting to fill the course. As far as pricing goes, I took a look at what founders were paying for similar courses. Justin Jackson sells his Marketing for Developers course at $299 and has made quite a few sales. Given that I’d be solving a similarly painful problem for the same kind of audience, this seemed like a great starting point for my course as well. Obviously $299 is too little to charge for ~10 hours of coaching, but I wanted to test whether founders would pay $299 to learn sales, not find out how much they’d be willing to pay for an intensive coaching course. Normally, I’d follow the advice of my landing page checklist and create a short landing page. But given the subject matter, audience and my experience, I decided to try a long-form landing page. I’d never done this before, but had wanted to experiment with it for a while. Brennan Dunn sells to a similar audience with a long-form landing page and it converts really well. I wanted to try it too! 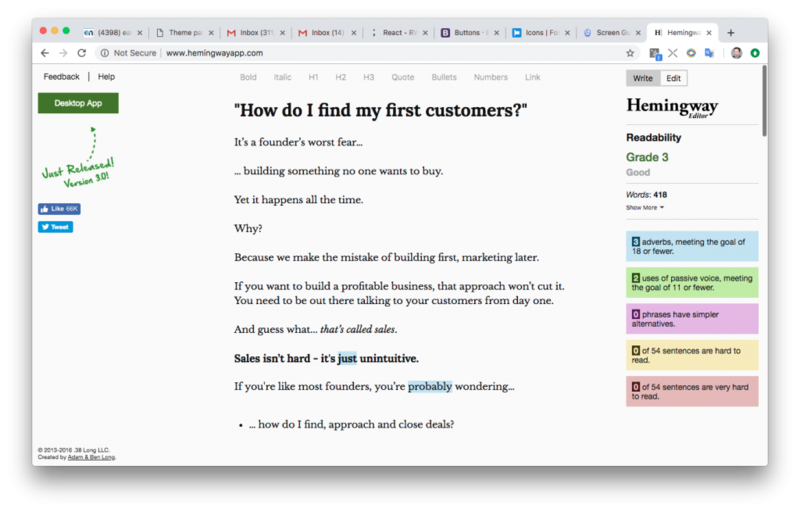 After editing, I coded up the copy into my ‘normal’ landing page template, added social proof, and made some tweaks/additions. For the first time ever, I was happy that my final word count was longer than the first draft! I wasn’t expecting many people to sign up, so I decided to save time and use a simple Typeform where people could register their interest. This was my first big mistake (more on that later). By this point, I’d been working for ~3 hours total. No-one knew about the course. And I’ve done enough product launches to know that meant one thing – I would be launching to crickets. So I went back to my newsletter subscriber list and tried to identify a group of founders who needed my course. It turns out that 37 of my subscribers had regularly reached out to me about sales or clicked on multiple newsletter links to sales advice over the past two weeks. So I decided to send them an email offering them a spot on the course. Are you struggling to make sales and find your first customers? 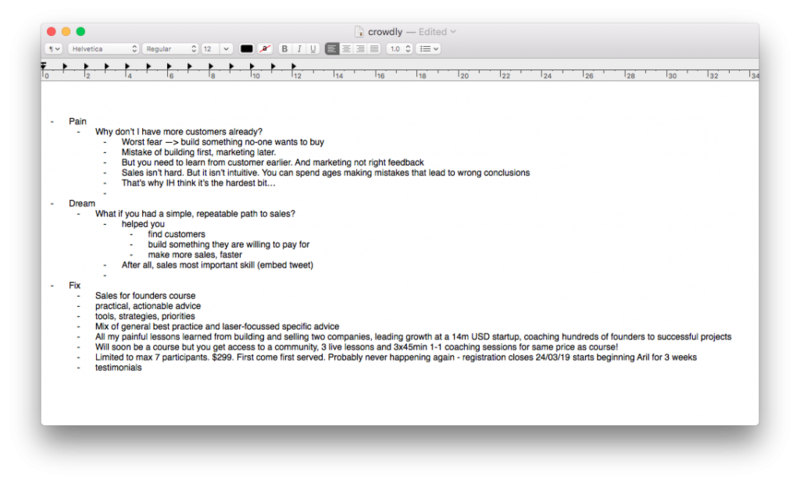 I’m putting together a live sales course for founders like you. You’ll get 1-on-1 coaching and live video tutorials – where I show you the most important sales lessons. Lessons I learned building two companies and selling $millions of software products. But hurry – there’s only space for 7 participants and it’s first come first served! Find out more and claim your spot here (I’ll apply your discount automatically don’t worry). PS If this email doesn’t apply to you or you don’t want to receive another offer like this then don’t worry – I‘m never going to send an email like this again! In a moment of classic founder imposter syndrome, I decided to offer the course to my subscribers for a 50% discount. After all – even though people pay me $hundreds/hour for my advice as a consultant on a regular basis – who’s going to pay me $hundreds/day for my advice? A lot of my subscribers, it turns out. So, in a panic that the seven available spots would sell out before I even launched properly, I rushed to Twitter. With a hurried tweet, I launched my sales for founders course to the world. You’re a founder & wish you were better at sales? This is your chance… I’m packing 9 years of painful mistakes into a live sales bootcamp. 6h over 21 days. I don’t have a large Twitter following, so I reached out to three friends who were online and asked them to retweet and share with their audience. My tweet reached quite a few people and I should have asked more friends to retweet it. I wasn’t expecting to reach seven sales without a lot of hard work, so I had a terrible process in place for payment. I should have gone with Gumroad, but instead I just replied to the first seven applicants by email with a payment link, asking them to confirm their spot by paying within 24h. Those who paid then received a welcome email. Anyone else who applied (but I didn’t have space for) received a waitlist email with a discount for the any future version of the course. I launched on Wednesday the 13th. Within 17 minutes, all seven spaces were booked and the course was sold out. Within ~26 hours, the landing page had 161 unique visitors and 31 people signed up to participate in the course. 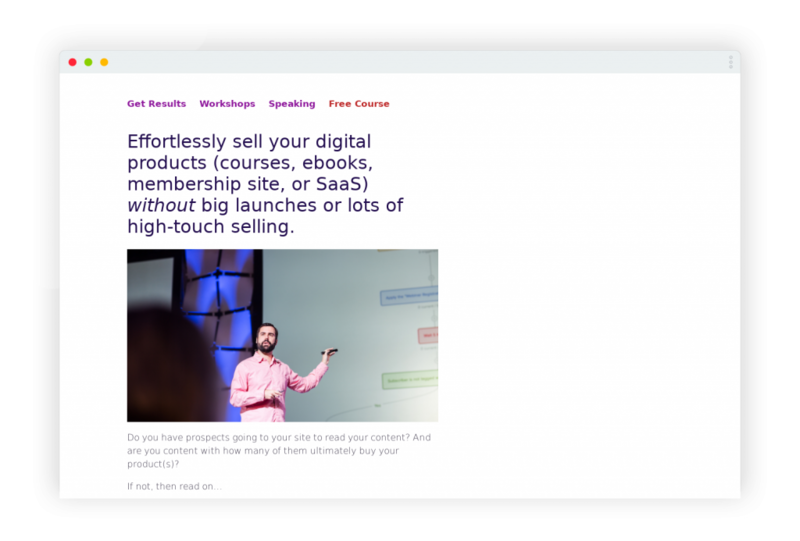 Due to my silly 50% offer for newsletter subscribers, 4 of the first 7 to sign up (and 8 in total) for the course came from my newsletter and only had to pay half price. Combined with the other 3 out of the first 7 sales at full price from Twitter, that left me with $1494 in revenue. 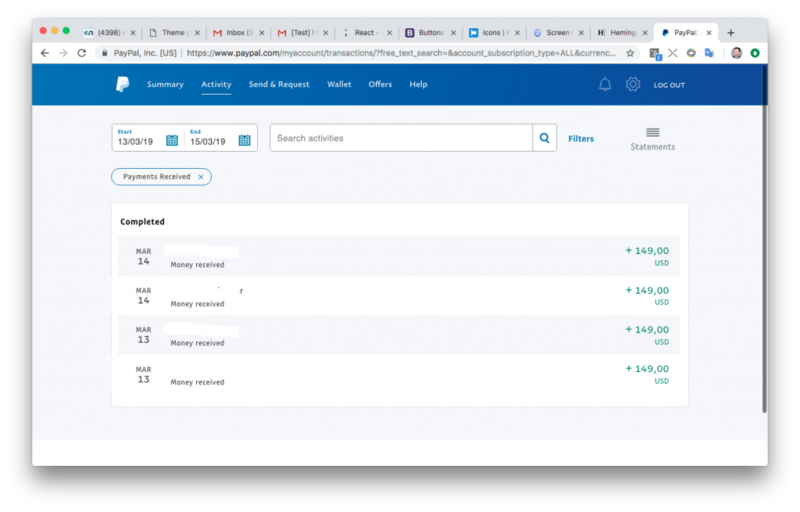 All booked from sales within the first 17 minutes of going live. Leaving aside the needlessly lost revenue of $596 in discounts my imposter syndrome convinced me to give, I’m happy with the results. It felt good to give my newsletter subscribers a discount – but 50% was unnecessary. Trust your own value! I only asked three friends to share on Twitter. Sure, by that point I’d already sold out so there wasn’t any point sharing further. But still, next time I would plan that further in advance. There were places I wanted to launch but didn’t have time to before the course sold out. Indiehackers.com for example. The course begins in the first week of April. I’ll be posting here and on Twitter about the results. If you want to sign up to the waitlist, you can do so here. If you do so in the next few weeks, you’ll get a $200 discount off the final text/video course when it launches later this year. Sorry that this write up was so rough – I didn’t have much time but wanted to get my thoughts down anyway. If you have any questions or feedback, I’d love to hear them.